You've stolen the cursed idol from the temple, and now you have to run for your life to escape the Evil Demon Monkeys nipping at your heels in this free game. The addictive mega-hit Temple Run is now out for Android! All your friends are playing it - can you beat their high scores? !You've stolen the cursed idol from the temple, and now you have to run for your life to escape the Evil Demon Monkeys nipping at your heels. Test your reflexes as you race down ancient temple walls and along sheer cliffs. Swipe to turn, jump and slide to avoid obstacles, collect coins and buy power ups, unlock new characters, and see how far you can run! Free Game Features: - A fast and frenzied experience; - Very addicting… definitely a very different running game; - Voted by TouchArcade Forums as Game of the Week; - One of TouchArcade's Best Games of the Month; - Over 50 MILLION players worldwide. 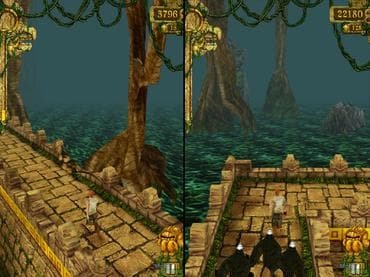 Если у Вас есть вопросы, связанные с игрой Temple Run пожалуйста используйте эту форму для связи с нами.